Join the discussion on our forums! Come discuss Arcanosmith over in our dedicated Arcanosmith discussion topic. I keep seeing this card (read: I've seen it 3 or 4 times since release) I don't understand why. Do they realise that I can attack the shield 2x and take no damage? I mean, even Mogu'shan Warden will do SOMETHING while it gets killed. The reason for Shieldbearer was that it cost 1. So it was easy to throw out in Warlock before refilling your hand/avoiding discard triggers. It's not the kind of card that belongs in ever deck especially one that wants to flood the board with minions to take down the opponent. this card is specifically designed to stall the game for one turn on 4 or 3 if you can get it out. Both cards are throw away and if they survive the next turn it's just a bonus. It's the same principal people play Doomsayer in their deck to stall the game for a turn to get further up the curve. So for control or late game decks the card is a mid range answer to keep moving up the curve safely. The soundfiles for shield are wrong. Its summoning line is "I am glorious!" and attack line is "Shield slam!" I think this card is underrated because a lot of people don't realise the 1 health makes a pretty big difference. Generally a 3 drop or 4 drop has 3 - 4 attack, so having 5 health on this minion means your opponent is either going to need some damage buff or a removal spell such as Shadow Word: Pain to get rid of this card. (Or something that does 1 damage like Wrath). On top of that, once they've most likely wasted 2 attacks on the 0/5, you still have a 3/2 to attack something with, so over all I think this card does a very good job at stalling. 4 for 3/7 is already huge value, drop a flametongue or dire into the mix and this card gets insane value. this is really really good for any shaman. 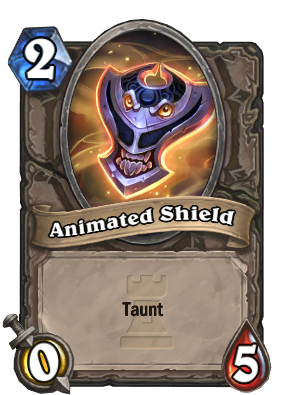 Don't forget that any card that has Silence neutralizes the taunt minion this card summons. Mmmh I think this looks very overcosted because the stats are badly distributed. Basically it summons a Shieldbearer with 1 extra HP for 1 extra mana. The split stats and the fact the token doesn't have attack make this card very poor. It should be at least a 2/2 that summons a 1/5, it wasn't so hard to do that. I am really curious about the the art of a 0/5 minion. Hopefully it plays into the way the guy is sort of looking to the right in this card. Want a 10/10 Taunt hitting you in the face T5? Drop this card T4 as a priest and you can do that. The upside of this card is it's two bodies. Hopefully at least one of them will survive to be buffed on the next turn. A single kill card or a single fat minion can't kill them both. This card is designed for buff decks. Very situational but it's not the worst card ever. Late game it could stall for the one turn you need to win. Yeah not a great catd but not the worst ever either. I only will spend gold with Karazhan to get my arcane dust. 80% crap. Good with flametongue + evolve tho. Can't see it being played in constructed but decent-good in arena. 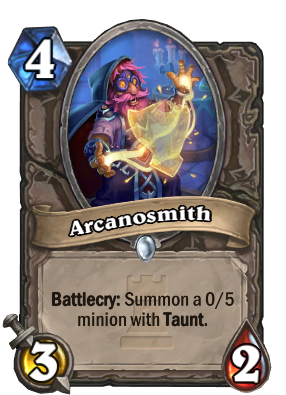 Arcanosmith: HA ha, no one can get past MY Taunt! If the opponent will trade into this minion, we can assume this as a 0/5 taunt with a deathrattle of 3/2 minion that is already triggered. Sludge Belcher is a 3/5 with a deathrattle of 1/2, both taunt. Or maybe Sen'jin Shieldmasta is a better minion to compare because of the cost being same. You get 2 extra hp, and 5 hp on taunt is not bad but 3/2 is easy to kill with lots of spells and doesn't trade very efficiently with other turn 4 minions. On the other hand, it is one more token for temporary or permanent buffs. The cost seems fare. 3/2 is 2 mana, 0/5 taunt is around 1-2 mana. If it is combined into one card, 4 mana is normal like Seal of Champions. Final thoughts: I don't really know if it's good or not. Maybe this is just part of Ben Brode's twisted plan to make Priest viable, as this card is a clear buff to Cabal Shadow Priest.